Willie Mays. Hank Aaron. Ty Cobb. Babe Ruth. Not only are these iconic names in the sport of professional baseball, they’re instantly recognizable to most Americans. Even their respective nicknames, “Say Hey Kid,” “Hammer,” “Georgia Peach,” and “Sultan of Swat” are known to many ardent non-sport fans. But what if I asked you about Ed Delahanty? Mention his name to most self-described baseball fans, and more than likely a shrug of the shoulders would be their response. Not only was “Big Ed” one of the greatest right-handed hitters of all-time, his untimely death at the age of 35 remains one of the most fascinating mysteries in the annals of the sport. Unfortunately, the temperamental superstar was addicted to alcohol and gambling, and became as well known for his binge drinking and betting on the horses as he was for his abilities on the field. When “Big Ed” got too far in debt, he begged his teammates for money and threatened to kill himself if they didn’t help out. Despondent and flat broke, he boarded a Pullman train in Detroit, the Michigan No. 6 to New York, on July 2, 1903. Becoming a nuisance by smoking, drinking heavily, threatening riders with a razor, and damaging the train’s emergency tool cabinet, conductor John Cole removed Delahanty from the train in Ontario, Canada. Since the train had crossed the International Railway Bridge, “Big Ed” decided to walk across the 3,600-foot span toward Buffalo, New York. Approached by night watchman Sam Kingston, who was on patrol looking for smugglers, angry words were exchanged between the two men. Delahanty began running toward the American side and either jumped or stumbled, falling 25 feet into the deep water of the Niagara River. His body was found 20 miles downstream at the base of the Horseshoe Falls by passengers riding the “Maid of the Mist” boat and was buried at Calvary Cemetery in his hometown of Cleveland. 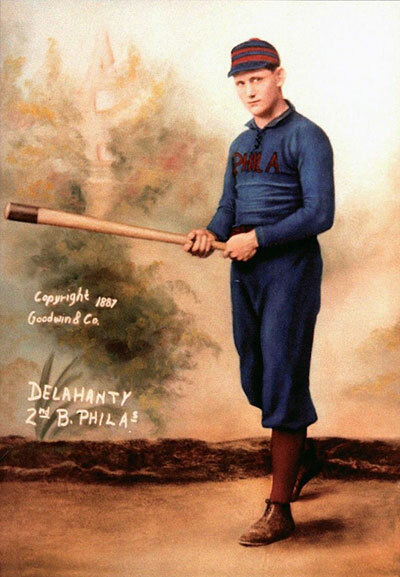 Dead at the age of 35, it’s unclear if Delahanty accidentally died or committed suicide. One of the greatest players in the history of the Philadelphia Phillies franchise, “Big Ed’s” tragic end is destined to remain a mystery.